It has been a while since I planned out an entire week's worth of meals. Between moving and everything else we have had going on, I have been just winging it. However it's time to get back on track and plan for the week. I feel so much more organized and not as stressed when I have a set meal plan for the week. When I sit down to make my plan, I first look at the weekly circulars. I start with proteins, picking out whatever meat or seafood is on sale or looks good, and then plan my main dishes day by day. Once that is done, I add in sides. We always have a veggie side, and almost always have some sort of starch. I like getting creative with sides when I have the time, and felt like making something new to go with simple grilled, rubbed pork chops. I have a lot of resources that I use when planning - my blog, blogs I follow, Epicurious, various other cooking sites, and of course - Pinterest. 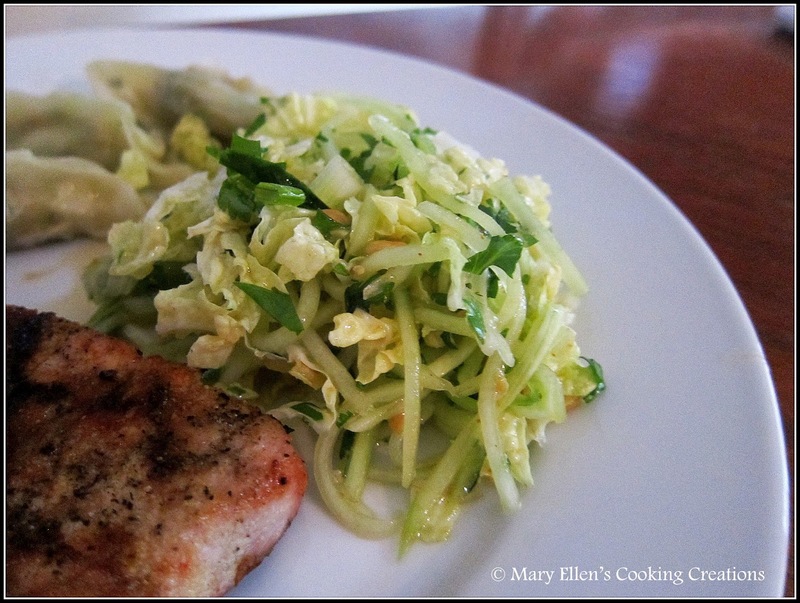 The recipe I chose to go with the pork chops was one I first saw on Pinterest, and comes from the blog Healthy Seasonal Recipes. I liked that it was a cold side, especially since the weather is still on the (very) warm side. After reading the recipe, I decided to make some changes. 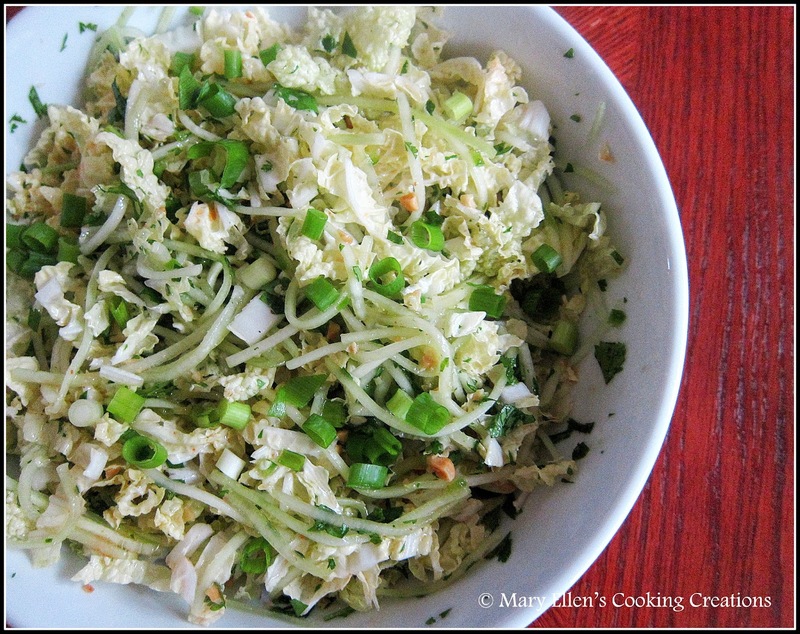 I added jalapenos and green onions to the salad, chopped the peanuts, and made some changes to the original dressing, including adding sesame oil and Sriracha sauce and changing the amounts of some other ingredients. What I got in the end was a salad that would have fed 5-6 people, but ended up only feeding 2 of us... it was THAT good. The salad itself had a lot of textures, and the dressing was perfectly sweet and spicy. I'm so glad I made the changes that I did - it definitely brought the flavors up a few levels. In a large bowl, toss the cabbage, cucumber, jalapeno, cilantro, and peanuts. Store the salad and dressing separately in the fridge until ready to serve. When serving, pour the dressing over the salad and toss to coat. Top with the green onions.